Titoki Christian Healing Centre in-house Team promoting & supporting everyone with the opportunity to experience wholeness, enrichment and transformation of life through our Lord Jesus Christ. We’re Keith and Lynda Jellyman. We’ve come from Eastwest College of Intercultural Studies in Gordonton, Hamilton. Eastwest is a missionary training college run by WEC (Worldwide Evangelisation for Christ) Aoteroa NZ. Over our twenty years there we were involved in a lot of practical work, with Keith helping with building and Lynda developing the gardens. Keith also taught World Religions (Buddhism), Pastoral Care and Spiritual Formation. A highlight for Keith was taking student teams to lead services at Waikeria and Springhill prisons. During our time at Eastwest Keith completed a Diploma in Counselling and Lynda a Diploma in Landscaping. We’ve also been involved in leadership at the local Presbyterian church during our time in Gordonton. We were both born in Blenheim. On leaving school Keith trained as a nurse and became a charge nurse in a surgical ward. Lynda studied Horticulture at Lincoln College and worked for a few years with the Ministry of Agriculture and Fisheries. 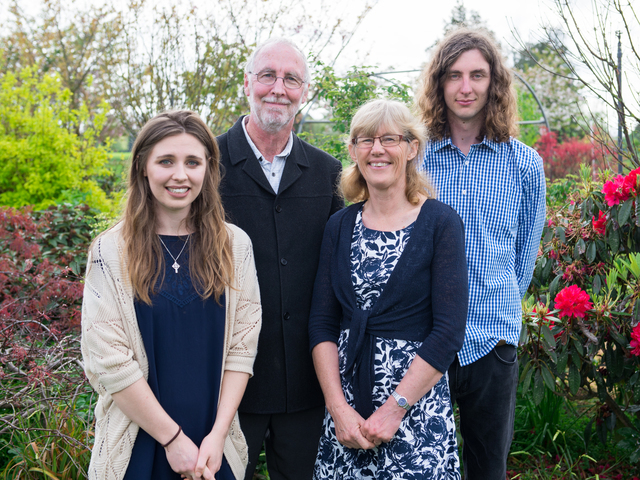 When first married we went market gardening in Tauranga before heading to Tasmania to study at the WEC Missionary Training College for two years. Following that we joined WEC and served in Thailand for four years. We have two children, Simon and Kate. Kate is a florist in Auckland and Simon works at a wholesale nursery in Cambridge.